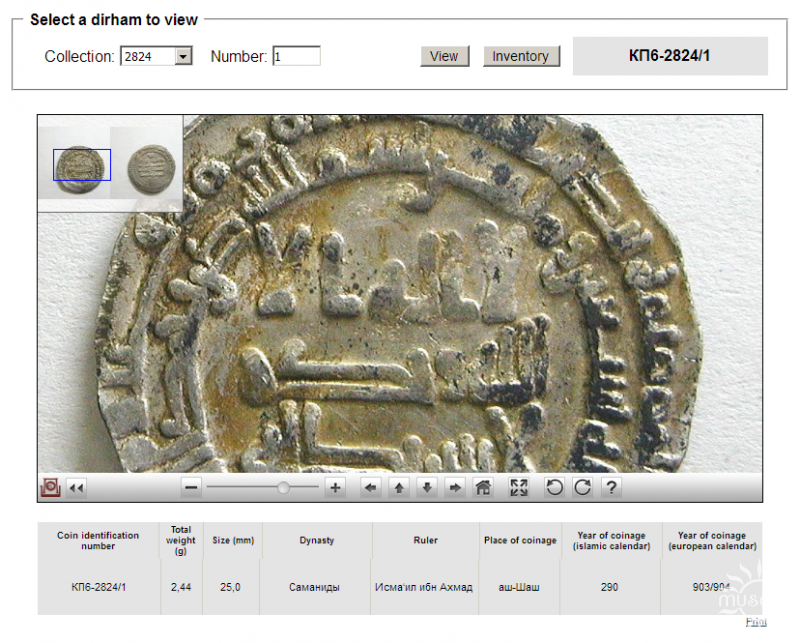 Electronic catalogue of images of the Koz'jankovskij treasure of Arab Kufic dirhams of the 9th — 10th centuries is now online! Museum collection of Polotsk National Historical and Cultural Museum-Reserve includes the largest cash deposit of Ancient Rus' — Koz'jankovskij treasure of Arabic Kufic dirhams of the 9th — 10th centuries. The main part of the treasure (7650 coins) entered the repository of the Museum-Reserve in 1973—1974 shortly after the discovery, later they added 13 more coins from private collections. The most recent coin of the treasure is the Samanid Nuh Ibn Nasr Dirham, minted in Samarkand in 333 AH (944/945). It makes it possible to date the fact of the treasure hiding no later than the second half of the 940s. Thus, only 7663 treasure coins are kept in Polotsk National Historical and Cultural Museum-Reserve. The total weight of dirhams is 19893.8 g of silver 960°. The initial study of the treasure was carried out in 1992 by the head of the Numismatic Office of the Belarusian State University Valentin Rjabcevich and the senior researcher of the Numismatic Department of the State Hermitage Igor' Dobrovol'skij. The next stage of the complex study of the treasure came in 2009—2011. Within the framework of the project G09-217 of the Belarusian Republican Foundation for Fundamental Research, Research and Educational Institution of Culture — Polotsk National Historical and Cultural Museum-Reserve, together with the B. I. Stepanov Institute of Physics of the National Academy of Sciences of Belarus conducted the research on the unique treasure. The studies were conducted by both numismatists and physicists. The research on the composition of Koziankovsky treasure was carried out by the researcher of the Numismatics Department of the State Hermitage Museum Kuleshov and researchers of the Museum-Reserve. A chemical study of the composition of coins with a laser spectral analyzer was carried out by the staff of the Institute of Physics of the National Academy of Sciences of Belarus the Candidate of Physico-Mathematical Sciences Bel'kov and the Doctor of Physico-Mathematical Sciences Rajkov. 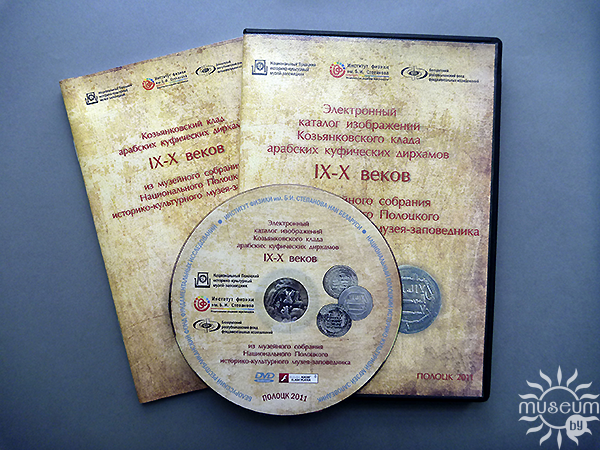 The final result of the project was the publication of the Electronic catalogue of images of Koz'jankovskij treasure of Arabic Kufic dirhams of the 9th — 10th centuries from the museum collection of Polotsk National Historical and Cultural Museum-Reserve on DVD in 2011. The catalogue contains images of obverse and reverse of all coins of the treasure, a complete inventory of coins, as well as a brochure with scientific articles by researchers of the Koz'jankovskij treasure. Today researchers-numismatists, historians and all interested visitors have the opportunity to use the Electronic catalogue of Koz'jankovskij treasure images on the official website of the Museum-Reserve, which contains images of 7663 coins and a complete inventory of the treasure.